Another widely favorite master is Sultan Khan, who went by the name of "Mir Sultan Khan". He went to England from India in 1929. (Now a part of what is called today as Pakistan). He returned to Pakistan in 1933. It was his master's wish (Sultan Khan was merely a servant), his master was a Maharaja. 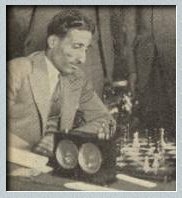 In the four years in England, Khan won the British Championship, defeated ex-World Champion Jose Capablanca, and played first board for England during the World Chess Olympiads in 1931 and 1933. "(1905-1966) Sultan Khan won the British championship in 1929, 1932 and 1933, and represented England in three Olympiads. He had a great natural talent for the game which brought admiration from Capablanca who called him a genius." The great Paul Morphy played for 3 years, 1857-1859. The great Mir Sultan Khan played for 4 years, 1929-1933. How do they do that and be so good ?